Jungle walk in the Seven Meadows: A walk through the seven meadows of Chail offers a comprehensive experience of the region. You’ll come across streams, grasslands, wild animals, flowers and crop fields, as the soothing winds and the deep gorge views take your breath away. Hikes Embracing nature at its purest, Koti is home to multiple short hikes. Stroll across the thick Deodars and a sprawled jungle, spotting unique flora and fauna on your way. Manuni Peak Head to the Manuni Peak for a top-view of the village. A great place to observe sunrise and sunset, the Manuni Peak is accessible by a short and adventurous hike through the forest. Birdwatching Since Koti is an offbeat village, it is easy to spot unique Himalayan birds around here. The Steppe Eagle, Vultures, Western Tragopan, and Pheasants, amongst other birds, can be spotted if you have the eye for them. Chail Cricket Ground The highest cricket ground in Chail region doubles for a plain that offers spectacular views of the Himachali mountains. Kali Tibba Temple Sitting at the top of a hill, the Kali Tibba Temple looks out at the gorgeous Choor Chandni along with the Shivalik mountain ranges. Make it to this temple in the evening for a pleasant sunset view. Chail Palace Spread across 75 acres, the Chail Palace was built during the British Raj. With great architecture and marvellous views all around, this is a must-visit place in the Chail region. Kufri You can plan a day-trip to Kufri, which is only 15km from the village. Visit Mahashu Peak and the Himalayan Nature Park for a good time. If you’re heading there in winters, don’t forget to go for Tobogganing and Skiing. By Bus - All the out-station buses come via Shimla, Nearest ISBT in Shimla, from here buses towards "Chail" can be boarded. Drop off at Koti village. The property is at Koti Near Cedar Heights. By Air - The nearest airport is Shimla Airport which is located 48 km away from Koti. You can make the onward journey to Koti Village by Bus or Taxi, approx. fare for taxi - INR 1500-2000 (Approx). By Train - The nearest railway station is Shimla which is located 30 km. You can make the onward journey to Koti village by Bus or Taxi, approx fare for taxi - INR 1200-1500. (Approx) Self Drive/Own car - Shortest way to reach from Chandigarh to Koti is to come via Kandaghat-Chail-Koti and alternate route is to reach Koti is via Shimla - Kufri- Koti For further detailed directions, please call the property prior to your arrival. Chail is popular amongst wanderers as one of the few regions of Himachal Pradesh that maintains a pure connection with nature. With virgin forests and deep gorges, the towns in this region are a treasure-mine of natural beauty. 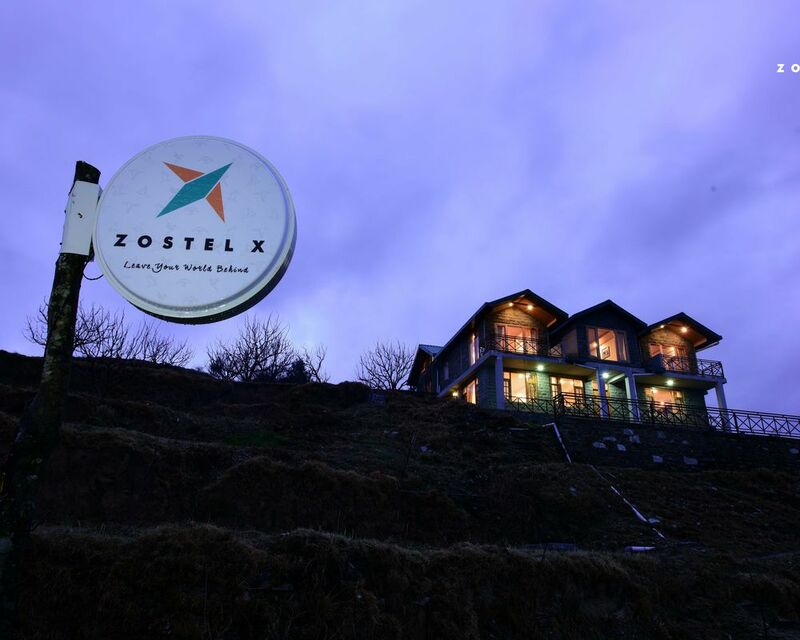 Located on a hill-top called Koti, near Koti village on Kufri-Chail road, ZostelX Koti offers a stunning vista of Snowpeaks, Forests and Blue sky on the same canvas. This is a perfect place for family, group of friends or ones who wish to live in complete isolation away from hectic city life. Here at ZostelX Koti sun casts spellbound shades on to the blue sky, making you get up to picturesque sunrises and date in breathtaking sunsets. Guests have access to small jungle walks in nearby woods. The property offers a 360-degree view from its campus. If you are traveling with kids be prepared to keep them engaged and entertained throughout the stay unless walking in the woods interest them. The walks in the woods of Pine, Oak, Rhododendron and willows brings you very near to nature. Classical Rock is always playing on a speaker of the property and contain a lot of old school albums containing pics of travels of the host dating back even to 1980s. Travel suggestions, stories and cool classic rock lover host makes evening teas a great experience here at ZostelX Koti. Mr. Bharadwaj has been in the travel industry for over two decades. His extensive travels have even led him to the most unique corners of Himachal. If you’d want to know a thing or two about offbeat places to explore, you know where to go.